For an in between snack, a side-dish or to fill a school lunch box these pizza muffins have an ideal serving form and size. Pizzas have conquered the world for a long time in many different shapes and sizes. There are the traditional round pizzas that can be found everywhere, square pizzas which we make at home due to convenience and pizza bread which makes a great snack. Pizza pockets which are also known as pizza calzones are popular in our family for picnics. For school lunch boxes we prefer the more bite size variation of pizzettes, a slice of pizza roll or a pizza muffin. Wash and dice the red capsicum, drain the sweet corn and the olives. Pit and dice the black olives. Then grate the cheese and set aside. Fill one bowl with one cup of flour and one cup of corn flour add the tablespoon of baking powder, the one and a half teaspoons of salt, the two teaspoons of oregano, the teaspoon of pepper and the two teaspoons of paprika. Mix all of the dry ingredients together well. In the second bowl crack two eggs, add a quarter cup of olive oil and the cup of kefir or yoghurt. Blend the liquid ingredients together well with a handmixer. With the handmixer, add the dry ingredient into the egg/oil/kefir mixture bit by bit. With a spoon fold the capsicum, sweet corn and olives under. Fill the dough into a muffin tray of twelve which is either greased or lined with muffin baking cups . 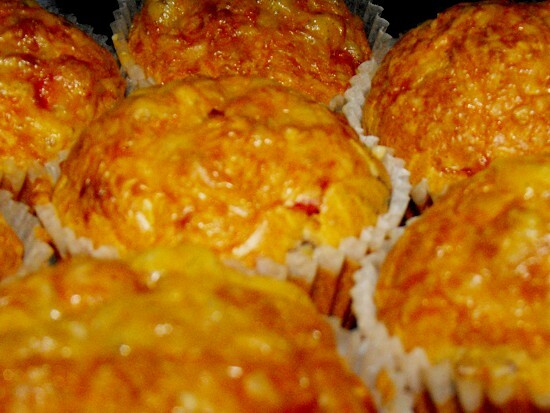 Lastly sprinkle the grated cheese over the top of the muffins and bake for 40 minutes at 180C°. Use a toothpick to test if the muffins are ready. When the toothpick comes out clean the muffins are done. When you tried these pizza muffins please come back and let us know how you got on with the recipe.